Our Premium Turf in Newport Pagnell has been developed to meet the highest standards, and we now supply a wide range of products in and around Buckinghamshire. We’ve been trading since 2001, and over the last few years we’ve expanded enormously and improved our delivery service with a fleet of 32 tonne lorries. Our specialist understanding on Premium Turf is complemented by a first-rate delivery, and we deliver to homeowners, landscapers, architects, local authorities and golf course owners among other commercial and residential clients. Back in 2003 we purchased a large chiller unit to ensure our turf and various other products can be kept fresh, enabling us to make deliveries in Newport Pagnell all year round, even when temperatures exceed 30°C. To place an order or to find out more about a particular product, get in touch with George Davies Turf today on 01234 714555 or 01727 821 765. You are always guaranteed flexibility with our Premium Turf in Newport Pagnell, but we usually ask for two days notice if you’re placing a large order with us. We only source proven products, and our turf grades come fresh from established UK based growers. 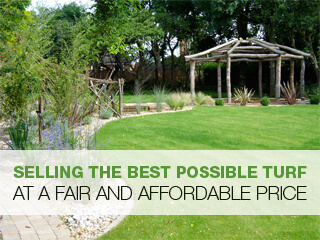 If you’re looking to complete your landscaping project in Buckinghamshire, our Premium Turf can give you a quality finish. We have every item you need to lay a new lawn, fill borders and top dress lawns, and you can read through our many testimonials to see what we’ve achieved for our previous clients. Our deliveries are made when you want it, where you want it, and our friendly team are always on hand to help you choose the right product for your unique requirements. George Davies Turf stocks everything you need to create a beautiful garden lawn, play area, park, golf course or bowling green, and no matter how large or small your land is, we can deliver a speedy, professional and dependable solution with our Premium Turf in Newport Pagnell. Our products deliver astonishing results, and you can visit our online gallery to get a glimpse of our quality landscaping products. We’re regularly making deliveries to Buckinghamshire with our 32 tonne lorries and telescopic forklift trucks. Over the years, we’ve built up a very thorough understanding on what each customer requires, and our items are always delivered in perfect condition.